language I can’t speak with a bunch of people I have never met. I am here to take part in a laughter yoga session, which runs twice a week in the city. The Monday morning group, designed to start the week with a smile, is outside at 7am, come rain or shine. Gellert Hill lies on the Buda side of the Hungarian capital of Budapest. 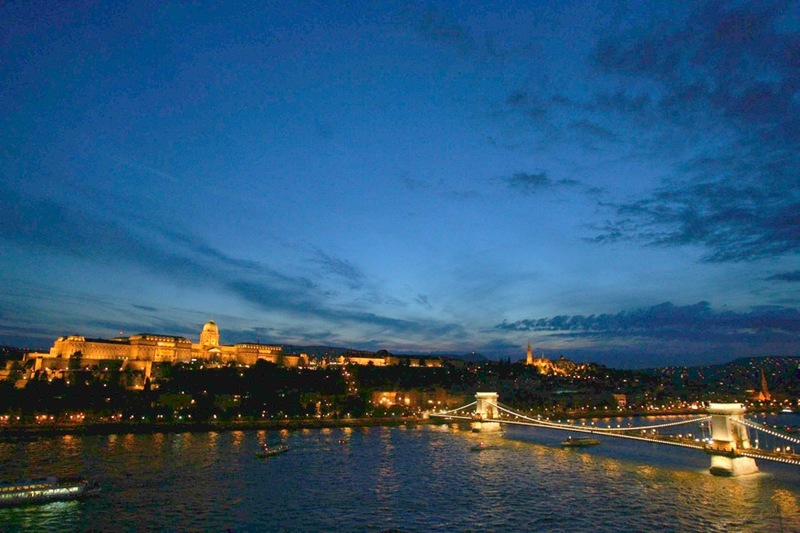 Buda is the old part of the city and is contains the famous Buda Castle and citadel. From our vantage point on the north side of the hill we can see the 19th-century splendour of the Pest-side parliament buildings and the shimmering beauty of the Danube. Spectacular views aside, it’s freezing cold and I have not cracked a smile yet. The group’s leader, Ferenc Domjan, an expressive, beaming Hungarian of a certain age, introduces me to the quickly assembling throng and immediately I am at ease. The rapturous laughter with which the two class members met earlier is replicated each time someone new arrives and I start to relax a bit when I realise they probably weren’t laughing at me. Having had nothing to laugh AT so far, though, I worry that I won’t be able to spontaneously erupt in such an easy fashion, despite the fact that – as a hobbyist comedy promoter – laughter plays a large part of my life back in the UK. As the class arrives in dribs and drabs, Ferenc begins to warm us up with some simple stretching exercises, delivered – praise the swami – in English and Hungarian. Most of the people here are Hungarians of middle to post-middle age. Among the ten or so people here, there is a handsome young man with long hair and a huge beaming smile, a gaggle of matronly ladies with well-coiffured hair and a couple of Japanese tourists. Ferenc calls out types of laughter he would like us to imitate and we oblige. “Now the laugh of someone who is very shy, through the fingers.” I can do this one as I am still terrified. As we circulate, peering at each other through closed fingers, my own ice begins to break and I scout the faces I would like to know more about. The next exercise involves laughing at someone with whom you are arguing. This entails pointing at someone and guffawing like they are a complete fool. It’s very liberating – for an inhibited Brit such as myself – being able to abuse a stranger in this way. There is a stunning-looking woman with long brown hair and an animated face. From physical appearance she appears to be a ‘proper’ yoga devotee and enters into the spirit of the session with gusto, encouraging me and singling me out for attention, making sure I have a partner when a partner is required. Budapest is one of Europe’s most beautiful cities and a visit there is never short of magical. But, in my experience, its people can be hard (if rewarding) to get to know properly. For anyone who has ever tried, the Hungarian language can be one of the most frustrating to learn and linguistic barriers can make conversing with Hungarians a traumatic experience. However, today, we are communicating purely through gesture alone and it’s a pretty amazing and liberating thing. As we run through scenarios in which laughter might be required – jostling on the tube, discovering our pockets are empty, laughing at a passport picture – it strikes me that laughter yoga is less a spiritual practice more a social strategy. And it’s not a bad one. Wasn't it Mark Twain who said that humans’ only effective weapon is laughter? Laughter yoga was born in 1995, the brainchild of Dr Madan Kataria, an Indian doctor and yoga student who recognised the medical benefits of laughter. There are now more than 6000 laughter yoga clubs in 60 countries. Ferenc Domjan got involved, he says, when his brother, a doctor, met a woman in Florida who claimed that her cancer was partly cured by laughter yoga. Ferenc tells me that he has had cancer patients in his groups who claim the therapy has done them more good than any conventional medicine. At the end of the session, I feel slightly bereft that I have to leave. The faces of my fellow group-members are etched in my brain forever and, though we have hardly shared a “jó napot”, we have shared the most intimate thing in the world, laughter. As I traverse the Elizabeth Bridge over the glistening Danube and the sun begins to warm up, I realise that the day hasn’t even really started yet and already I have myriad things to laugh about, not least that I am in one of Europe’s most stunning cities, I have a five-star breakfast followed by a luxury tokaij massage waiting for me on my return to the hotel. Altogether now….ahahahahahahaha.